I successfully ran my VMware vSphere ESXi 5.1 Nanolab for 18 months on my pair of Intel NUC DC3217IYE hosts. Early this year I got around to upgrading to 5.5. I had experienced some issues with my vCenter Server Appliance so ended up just rebuilding the lab from scratch and reattaching my old data stores. Having written all of this up, I then promptly forgot to post it! So for the sake of continuity (before I do the same for 6.0 shortly), this article covers the process. In addition I also purchased a 3rd node for my lab, the 4th Gen D34010WYKH model (also with a Core i3), with which I was able to test and prove the process on as it uses the same NIC chipset. 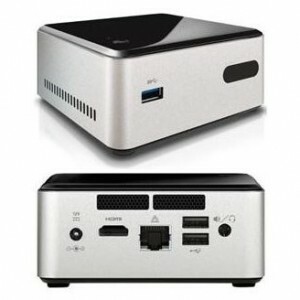 The following are updated instructions for installing vSphere 5.5 on Intel NUC (any model with the Intel® 82579V or Intel® I218V onboard NIC should work). A USB Stick. This should work on anything over 1-2GB but personally am using 8GB PNY Micro Sleek Attache & 16GB Kinston DataTraveler Micro drives as they’re tiny, so less likely to catch on anything as they stick out the back of the NUC box, and they cost less than £5 each. A copy of VMware Workstation 8 / Fusion 6 or newer. If you do choose to add this in as well to your image, simply run the customiser twice, once for the network VIB, then a second time for the SATA vin, using the interim image as your source for the final image. Install ESXi to your USB stick using VMware Workstation / VMware Fusion and the customised ISO you will create below. Run the ESXi-Customizer-v2.7.2.exe (latest version at time of writing). Create a new VM, you can use any spec you like really, as ESXi always checks on boot, but I created one with the similar specs as my intended host, single socket, 2vCPU cores. RAM doesn’t really matter either but I use at least 4GB normally. This does not require a virtual hard disk. This will mount the USB stick inside the VM, and allow you to do a standard ESXi installation onto the stick. At the end of the installation, disconnect the stick, un-mount and unplug it. This is the easy bit, assuming you don’t have any of the HDMI issues I mentioned in the first post! Don’t forget to plug in a network cable (duh!) and keyboard for the initial configuration. If you wish to modify any bios settings (optional), you will also ideally need a mouse as the NUC runs Visual BIOS. Any questions/comments, please feel free to hit me up on twitter as I have recently disabled comments on my blog due to the insane volumes of spam bots they were attracting!